LONDON – When the most famous flame in sports winds its way through the streets of London before entering the Olympic Stadium and providing the 2012 Games with one of its most iconic images, it will be seen as a touching gesture of symbolism, grace and a nod to the ancient world. Yet while the torch relay began once again at the historic site of Olympia on May 10 and is an integral part of any Games, its modern incarnation comes laced with sinister undertones that can be traced back to Adolf Hitler's Nazi Party and the controversial 1936 Olympics in Berlin. Many of those witnessing the final journey of the flame July 27 will have little idea that its origins do not lie in ancient Greece, and was instead formulated as a major part of the Nazis' plot to shift international opinion in their favor. "There had been no such torch relays in the ancient Games or, for that matter, in any of the 10 modern Summer Olympics preceding the Berlin Games," wrote renowned author David Clay Large in his outstanding book, "Nazi Games: The Olympics of 1936," which was published in 2007. "The torch relay was one of but many ways in which the Nazi Games helped define the modern Olympic experience as we know it today." The torch relay would play a major role in the propaganda offensive backed by Hitler and orchestrated by Dr. Joseph Goebbels. In the lead-up to the Games, the Nazi Propaganda Ministry supported a relay of the Olympic flame that would not only provide spectacular footage for Olympia, the 1938 film that was used to promote the Nazi ideal ahead of World War II, but could also be used for significant political and public relations benefit. The ancient Greeks had run relay races that involved flames as part of their worship to the Gods, but there had been no such symbolism in the modern Games. There had been a flame at Amsterdam in 1928 and Los Angeles in 1932, but it did not come from Olympia and there was no relay. Yet ahead of Berlin, the Nazis wasted no opportunity to ensure the flame's journey was used to promote the party ethos. At the lighting ceremony in Greece, a German ambassador dedicated the torch to Hitler himself, while a band played the marching song of the Sturmabteilung, the Nazi Party army, according to Large. 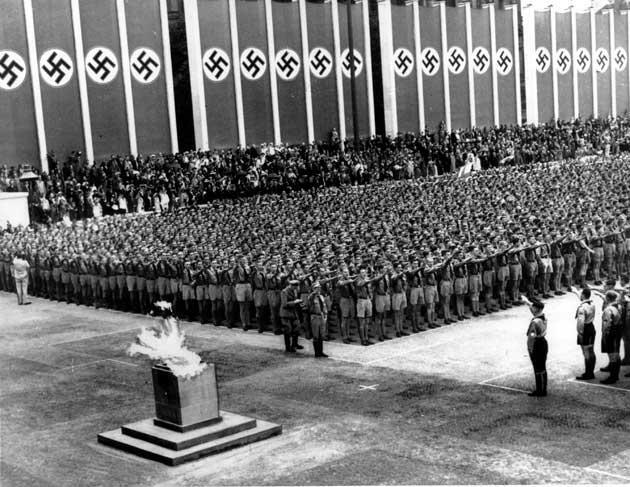 "The Nazis used the Olympics to give the German public an exaggerated sense of national superiority that later was used in the service of military aggression," said Dr. Rafael Medoff, director of Holocaust Studies at the David S. Wyman Institute in Washington D.C. "The games also gave Hitler a way to soften his public image in order to allay the international community's concerns about his bigotry, violence and militarism." Goebbels, Hitler's propaganda chief, carefully orchestrated coverage of the torch's journey toward Berlin, which stretched through the Sudetenland, the region of Western Czechoslovakia that Germany wished to, and eventually would, annex. Organization of the relay was left to Carl Diem, a leading German sports administrator and chief organizer of the Berlin Games who willed his extraordinary collection of memorabilia to a trust when he died in 1962. Yet Diem himself had a mixed past. He was a strong administrator and promoter of sports, and was not a Party member. Indeed, his wife's Jewish heritage led to him being regarded with suspicion by some Nazi higher-ups. However, toward the end of the war he gave an impassioned speech exhorting young German soldiers to fight until the death even as the full force of the Allied machine closed in. Walter Borgers, director of the Carl and Lies Diem Archive, spoke of Diem's passionate belief in the torch relay. "He saw this as his life's work," Borgers said. "He decided to make the relay part of the ceremony. It was the best advertising campaign of all time." Diem and film director Leni Riefenstahl created much of the vision, but it was wholeheartedly embraced by Hitler and the Nazis. On the last part of the relay through Germany, only blue-eyed blond males were selected and the torch led Hitler and other senior party members into the Olympic stadium. The imagery was powerful and the PR spin was, sadly, effective in persuading many observers that the Nazi regime was strong, but not brutal. "To a significant extent, these Nazi deceptions worked," Medoff said. "The New York Times reported to its readers that the Germans displayed 'good will' and 'flawless hospitality.' The Associated Press predicted that the games would help 'assure peace' in Europe." The truth of course, was very different and within three years the entire continent was at war. Yet when hostilities finally ceased and the Games restarted in London in 1948, the torch relay was considered an element worth keeping. Over the past 10 weeks, about 8,000 people will have carried the torch through 1,019 cities, towns and villages en route to London. How many know of the relay's murky origin is anyone's guess.